Purchased by J.P. Morgan (1867-1943) in 1920. 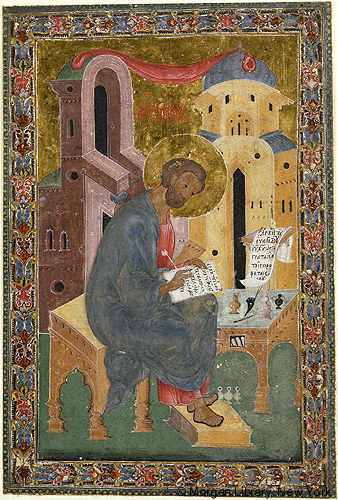 Parent manuscript written and illuminated in Moscow, spring 1596; sent as gift from the scribe (Arsenios, Archbishop of Elassona) to the Monastery of St. Sabas near Jerusalem; catalogued in 1897 by Athanasios Papadopoulos-Kerameus in the Jerusalem Patriarchate; put up as collateral on a loan in Damascus by the patriarch ca. 1918; parent MS returned to Jerusalem missing the incipit pages and Evangelist portraits; the latter (M.654.1-4) purchased by J.P. Morgan (1867-1943) from Dikran G. Kelekian in 1920. Ms. gospel lectionary single leaves; illuminated in Moscow, Russia, in 1596. Text: four incipit leaves; the parent manuscript from which these leaves are taken is owned by the Greek Patriarchate, Jerusalem (Anastaseos, cod. 5). Other incipit leaves from this manuscript are located at the Art Museum, Princeton University (MSS 54.67) and at the University of Toronto (MS M82.446). Scribe: parent manuscript written by Arsenios, Archbishop of Elassona. Decoration: 4 miniatures (Evangelist portraits).